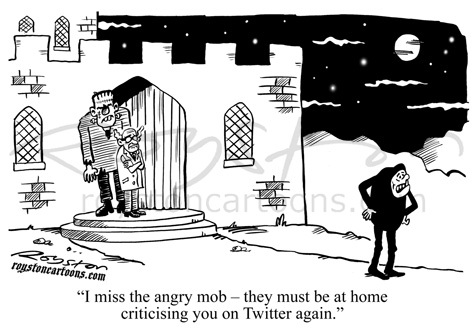 "I miss the angry mob – they must be at home criticising you on Twitter again." 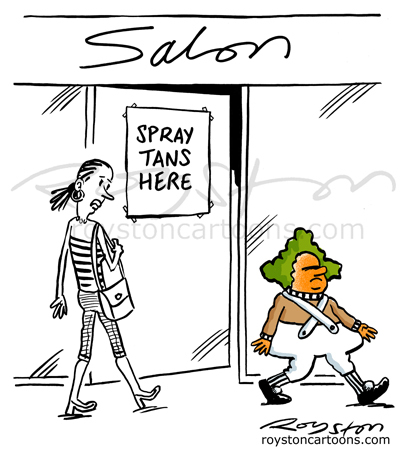 This was drawn to accompany an article in a law magazine, one of my regular jobs. I thought I'd throw in a topical reference to Judge Dredd, as the new film had just come out, and was pleased, and a little surprised, that they went for it. 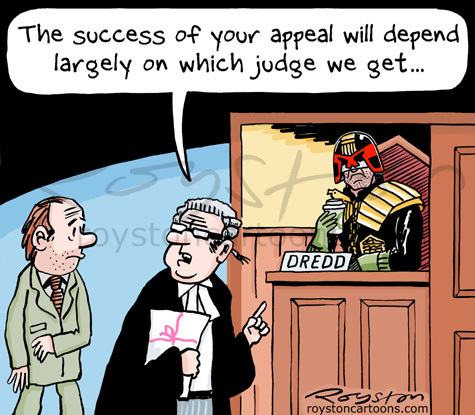 See more law cartoons here. 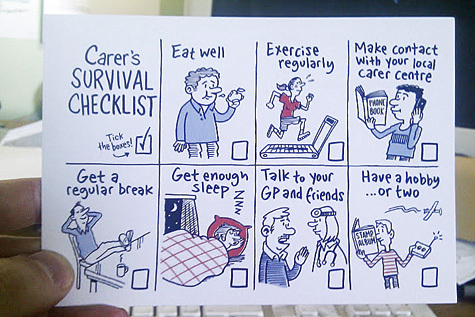 Sometimes my work is about cartoon illustration, rather than joke cartoons, as in this promotional postcard drawn for Crossroads Care in Greater Manchester. 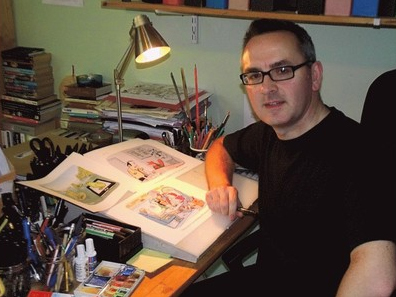 Click here to find out about commissioning custom-made cartoons. "Zombies! 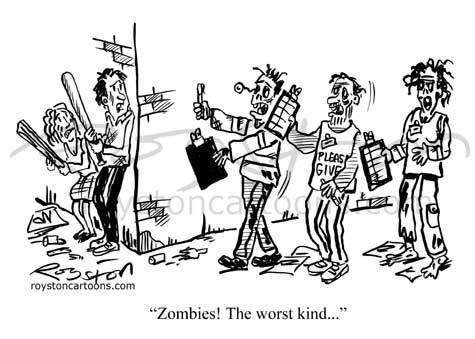 The worst kind ..."
Here's a cartoon about zombies that appears in the current issue of The Spectator. It's not a show that usually inspires cartoon ideas, but I came up with this after watching an episode of The Walking Dead. 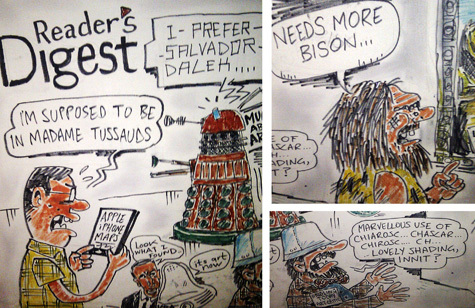 Much fun was had last Sunday at the Battle of the Cartoonists, part of the launch of this year's Big Draw, at the V&A in London. 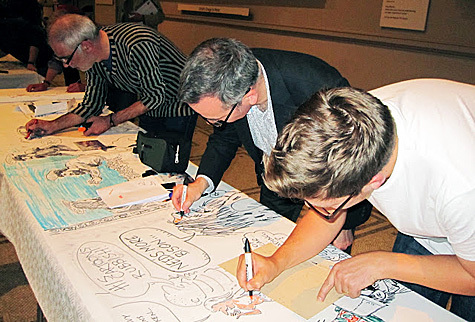 That's me, centre, above, with Steve Way, left, and Rob Murray, working on the Reader's Digest banner. Also on our team were Simon Meyrick-Jones and Nathan Ariss. 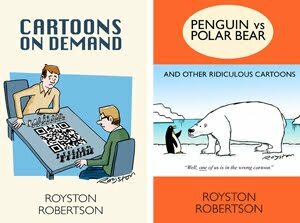 We were assigned the Raphael cartoon The Miraculous Draught of Fishes, so we drew a bunch of characters around an approximation of it – thanks, Steve! – some reacting to it, some not so much. As usual, the drawing surface was horrible and the pens were smudgy, but the results have a certain scruffy appeal. Here's a few of the bits I drew. Yes, I drew a Dalek, purely to appeal to the kids! It seemed to do the trick. And I make no apologies for the Salvador Dalek groaner. See lots more post-Big Draw stuff at the Procartoonists.org blog here, here, and here. Afterwards we ate, drank and got a little too merry, as is required at these things. Oh, and we didn't win. Private Eye won. Private Eye always win. 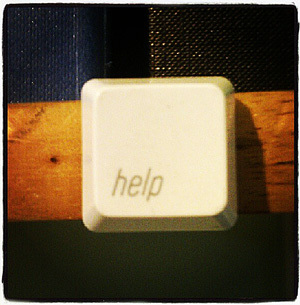 (Thanks to Ger Whyman and Nikki Harries for the photo).